Ocean County Library was honored as a Library of the Year 2013 Special Mention in the Gale/LJ Library of the Year issue of the library industry magazine Library Journal. 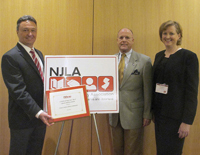 The special mention was due to Ocean County Library's ability to demonstrate innovation and excellence for service and dedication to the community. You can read about the Library of the Year award here.